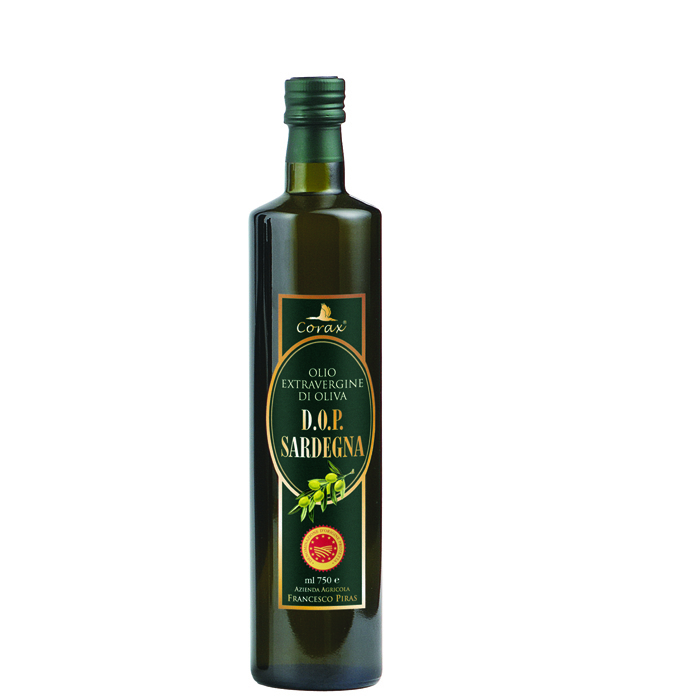 The extra vergin olive oil DOP Corax Sardinia belongs to the category of single varietal Bosana, can be classified as fruity. It enhancesc all of the qualities and characteristics of single variety of northern Sardinia, with pleasant aroma of green olives understood but persistent over time, with a pleasantly bitter taste and slightly spicy with hints of artichoke, milk thistle and green olives. It's the result of a meticulous and laborious application of the product specification, the specification that provides for the collection of a maximum of olives per hectare in a short period of time (by december), so asa not to allow the collection of olives too far ahead with the maturation, processing of the same must be done within 24 hours of collection at the Frantoio he certificate for processing olives D.O.P. The oil produced before being packaged as a D.O.P. is analyzed by the inspection with chemical and sensory analysis carried out by a group of tasters recognized. Appearance slightly, color green, scent green olives, taste harmonious, with hints of artichoke and cardoon. Excellente première, les soupes et les plats de lègumes.